A plea from William K. Hussey, 1932. Commemorating Hawaii’s role in WWI, 1919. THIS IS THE STATUE SCULPTED BY BURNHAM TO COMMEMORATE THE MILITARY SERVICE OF HAWAIIANS IN THE WAR. In the middle is the commemorative statue for Hawaii’s part it took in the war that was sculpted by the sculptor Roger Noble Burnham. This is that statue that is intended to be placed outside of Kapiolani Park in the area set aside for it by the legislature. This is the Memorial that Hawaii wanted to stand for all times, something for the people to look upon. On one side of the sculpture is a war leader, and on the other side, a Hawaiian girl. Beneath this is a soldier on one side and a sailor on the other side. Ka Nupepa Kuokoa, Buke LVII, Helu 20, Aoao 1. Mei 16, 1919. A mele by the “Solomon” of Hawaii, William J. Sheldon, 1918. A MELE FOR THE HAWAIIAN BOYS. These lines of mele were composed in English by our friend and famous composer of songs of these days, and in other words, the “Solomon,” Hon. William J. Sheldon (Kelekona). The music will be available soon as it is now being edited with great care. To the front thy honor to bear. That freedom and liberty be won. O Hawaii no ka oi. Ke Aloha Aina, Buke XXIII, Helu 25, Aoao 2. Iune 21, 1918. Red Cross knitting drive, 1917. 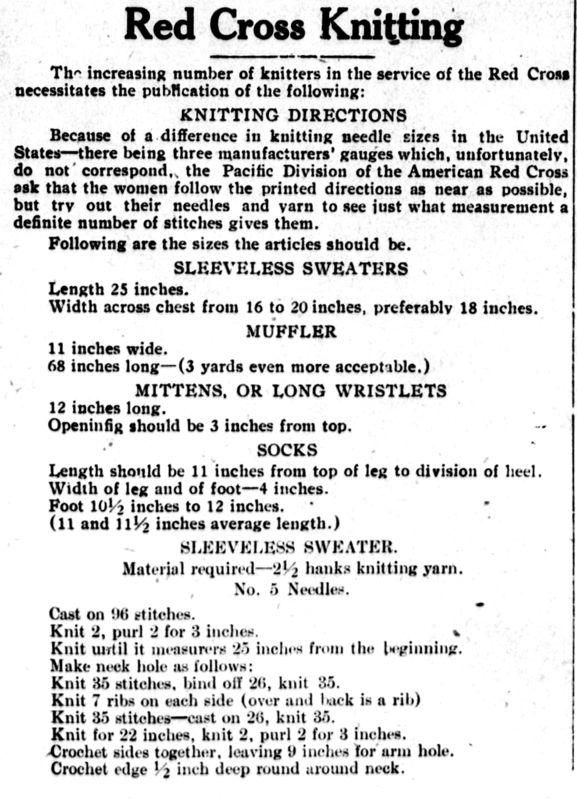 Because of a difference in knitting needle sizes in the United States—there being three manufacturers’ gauges which, unfortunately, do not correspond, the Pacific Division of the American Red Cross ask that the women follow the printed directions as near as possible, but try out their needles and yarn to see just what measurement a definite number of stitches gives them. Following are the sizes the articles should be. Width across chest from 16 to 20 inches, preferably 18 inches. Openifig should be 3 inches from top. Length should be 11 inches from top of leg to division of heel. Width of leg and of foot—4 inches. Foot 10½ inches to 12 inches. Knit 2, purl 2 for 3 inches. Knit until it measures 25 inches from the beginning. Knit 35 stitches, bind off 26, knit 35. Knit 35 stitches—cast on 26, knit 35. Knit for 22 inches, knit 2, purl 2 for 3 inches. Crochet sides together, leaving 9 inches for arm hole. Crochet edge ½ inch deep round around neck. The Garden Island, Volume 13, Number 49, Page 4. December 4, 1917. Another Hawaiian goes to war abroad, 1917. 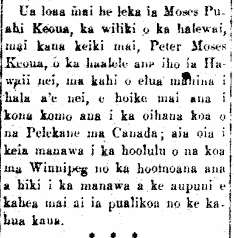 Moses Puahi Keoua, the engineer for the prison, received a letter from his son, Peter Moses Keoua, who left Hawaii nei about two months ago, which told of his enlisting into the British military in Canada; he is staying at the military base in Winnipeg until the government calls those troops to the battlefield. Ke Aloha Aina, Buke XXII, Helu 44, Aoao 4. Novemaba 2, 1917.